Dow Corning 785+ Sanitary Sealant is a bacteria resistant acetoxy silicone sealant. It protects against bacteria growth, MRSA, E. Coli and Salmonella. It is a one component silicone sealant that contains a fungicide to resist mould growth. This Product does not mould, it has a nice finish to it and it bonds well! If you want a good finish to your new bathroom or kitchen, but this product! If you are about to create a wonderful new shower area for you home, then you will need to thinking about waterproofing the substrates, which are the surfaces you tile on to. This product is the best on the market in James’s opinion. It’s easy to apply, some builders would charge you about £200.00 upwards to apply this! It’s dry by the next day, and it provides a good base for the tiles to go on to. You can buy it on it’s own but it’s best to buy as a kit, which includes the tape and primer also. Another one of James’s favourites, grip fill is perfect for those areas where you just cannot use screws or nails. 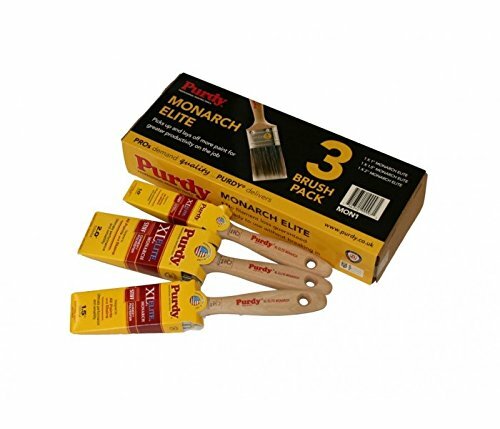 Purdy Monarch Elite Brush Set is a professional range of 3 brushes, 1, 1.5 and 2 inches. They are exceptional value brushes, suitable with all paints, varnishes and stains. The finish you get with these brushes are amazing and they are going to last you. So if you have a lot of decorating to do and you want to save money and invest in some good quality brushes from the beginning then these are for you.